my pointless: device translates dog sounds into words.... ? 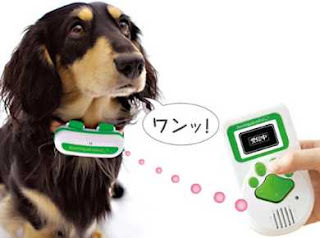 A Japanese company that specializes in making toys claims that they have developed a gadget that can translate a dog's bark into understandable human words. The Bowlingual Voice comes with a microphone device that hangs around the dog's neck. An additional handheld device is carried by the owner. The microphone records the sound of the dog's bark and sends it to the handheld device. The bark is then analyzed against a databse of dog sounds and "translates" it into human words. The translation can either be played audibly or read on the device screen. The developers at Takara Tomy claim that the device can detect six emotions (e.g. sadness, joy) and a selection of other common phrases (e.g. "I need to relieve myself."). An answering machine feature is also available to let you know what your dog was thinking about while you were away. "Get this dang thing offah my neck." "The device didn't get that last one right." "Here. You wear this part." "You know, you forgot the poop bags again." "This stuff tastes like dog food."